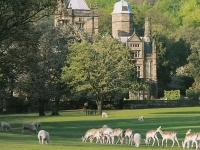 Holker Estate, the home of Lord and Lady Cavendish, is a wonderful attraction for visitors to the Lake District; in fact, it is known as one of the best-loved stately homes in Britain. The elegant Holker Hall and its gardens are open to the public, and there is a fantastic restaurant and gift shop on the premises. The lovely gardens extend into parkland and many visitors will enjoy a ramble in the countryside starting at the house. The estate also hosts the Cartmel Racecourse, a favourite among horse racing enthusiasts. An estate of rare class and elegance, Holker has recently been featured on the popular TV series Masterchef UK.